When attending functions in the winelands, I am always aware of how white the South African Wine industry is, and keep thinking of how we can change things more quickly. But change takes time, and education takes time. 1987 was a rough time during the apartheid years, PW Botha was the ruler of the day (and we think we have it bad with Zuma) and a state of emergency was called after the May elections. Anglican Archbishop and Nobel Peace Prize Winner, Desmond Tutu, then noted “We have entered the dark ages of the history of our country”. It was a brave group of members of EKOV (Elsenburg Cellar Technology Old Boys Association), who had the foresight then, 30 years ago, to develop and implement a training program called SKOP (Senior Kelderassistent Ontwikkelings Program). Fifty Cellar Assistants attended that first morning workshop on 22nd Oct 1987, and SKOP has subsequently gone from strength to strength, but the going has been tough. Finances were not always available, and it was with the incredible support of the Cape Winemakers’ Guild that progress was accelerated in 2014. Since 2006, the SKOP training has been managed by Wine Training South Africa, a non-profit organization, who, to date have trained up thousands of cellar workers. EKOV and The Cape Winemakers Guild are still integral supporters and members of WTSA, who are currently still the only Service Provider offering Accredited Training for Cellar Assistants in the South African Wine Industry. The FoodBev SETA has recently accredited a number of the SKOP courses, so major applause to Emma Burger and her team for the many long hours put in over the years. Big thank you to those wineries who have continually been working with WTSA to educate and empower their Cellar Assistants and thank you to the Cape Winemakers’ Guild, who have been enormously supportive, raising money through their auction to make this possible. Thanks also to Nedbank, the Department of Agriculture Western Cape and more recently The Cape Wine Auction for their support. 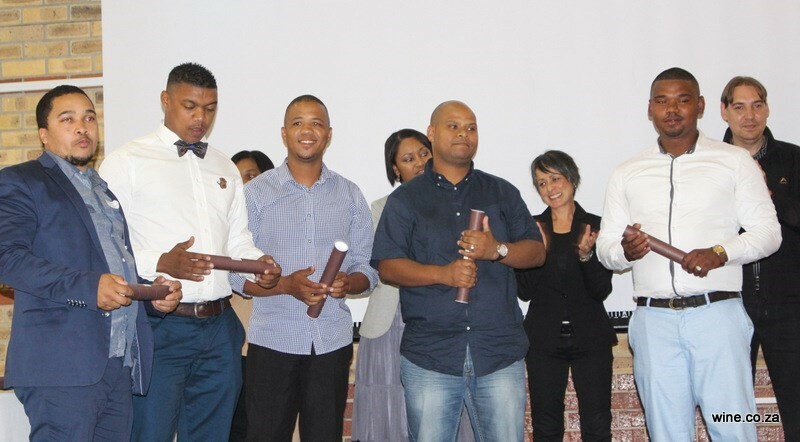 On Saturday 6th October, at the 30-year celebration of SKOP, five of the top Cellar Workers graduated from the first accredited course, viz the 18-month National Certificate Winemaking NQF Level 3 course. They received their first ever accredited certificates, a very proud moment. These dedicated cellar assistants have risen through the ranks having done all the prerequisite courses, SKOP1, 2, and 3. Their diligence and enormous enthusiasm for learning and getting ahead is admirable and we salute these first five. There are another 25 already busy with the next year’s course, so progress is accelerating at quite a rate! The National Certificate in Winemaking is aimed at providing learners with national standards that represent the competencies required to meet the challenges of participating effectively in the Winemaking industry as a multi-skilled cellar practitioner. Kudos to the first graduates Anrico Solomons (Linton Park), Heinrich la Fleur (DGB), Elveso Barry (Boschendal), Denovan Daniels (Jordan), and Chriswin Willemse (Raats) and well done to the wineries who have supported them throughout. I recommend that their employers keep a close eye on these guys, as they are gold. I do wonder what is next for them… Elsenburg wine-making degree? Promotions? The celebratory event at Elsenburg was such fun with over 180 graduates there from all over the winelands. It was a day focussing on leadership. I recently attended the Wineland Adams and Adams Leader of the Pack Seminar and while it was insightful, I must say – this celebration truly showed the real up and coming Leaders in the industry. One of the top students of SKOP over the years is Mario Damon – currently working at DGB. Mario was our Master of Ceremonies for the day, and he was a natural! It was his time in this role – refreshing, entertaining and candid he was. There were inspirational addresses in such wonderfully vernacular Afrikaans and English, from Shepherd Khosana from Robertson Winery, to Denovan Daniels from Jordan. We were entertained by incredible performers: Twin sisters Pindiwe and Bukelwa Panduva from Willowvale sang like angels, and popular poet/rapper Simon Witbooi of HemelBesem wowed the entire audience with his raw, relevant and risky performance. I was particularly impressed with HemelBesem, who comes from a difficult background in the Namaqualand, and has managed to make a success of his life using his natural affinity with the vernacular. He shared this with us with his talent of rapping, writing, singing, and engaging with his audience. He was truly inspirational. With the focus of the day being on true leadership, I also learnt about another ground-breaking initiative, which came out of a Masterclass held at Elsenburg on the morning of the 6th October. At a gathering of 180 of the SKOP alumni on the morning of the celebration, the SKOP Alumni organisation was formulated. The focus will be on sharing information, networking and enhancing personal skill sets, as well as incorporating an important leadership and mentorship programme. The structure is still being finalised, but Wine Training SA will be the umbrella organisation. Previous Nederburg Winemaker Natasha Boks, who also inspired the attendees at the celebration will definitely be involved. Watch this space for more as this develops. The first graduates of the SKOP program in 2005 included Randolph Christian, who has been at Rustenberg now for over 20 years and was rewarded last week as his Chardonnay was awarded the Top Chardonnay at the Prescient Chardonnay Awards by WineMag. Since 2006, 7,925 course participants attended programs including Technical Workshops, Marketing, Management and SAWIS. The SKOP component remains by far the single biggest short course with a total of 5,425 attendees, across all the modules. There is real change in the country and in the wine industry, but we need to see more of it, and not just see this change at one or two events in the year. Every award ceremony, every tasting panel, every competition needs to incorporate graduates to expose them to the greater community of the wine industry and not just the cellar worker side of things. We all need to think about every action we take, to see how we can make a difference through training, mentorship, exposure and upliftment. Drop for drop this is one of SA’s most expensive and sweetest wines. Whatever Andrea and Chris Mullineux touch seems to turn to gold and the Essence even more so. It took 4 years for this Chenin Blanc to ferment to just 4.5% alcohol, leaving behind a whopping 650g or 65% sugar! It is hugely rich, unctuous and exotic but with a high acidity that makes an impenetrable wine that will age forever. It is one of the highest rated SA wines from International critics with 98 points from Robert Parker’s Wine Advocate. One only needs a tiny glass to enjoy this ‘diabetic’s worst nightmare’. That’s if you can find it, as a mere 700 bottles were produced.